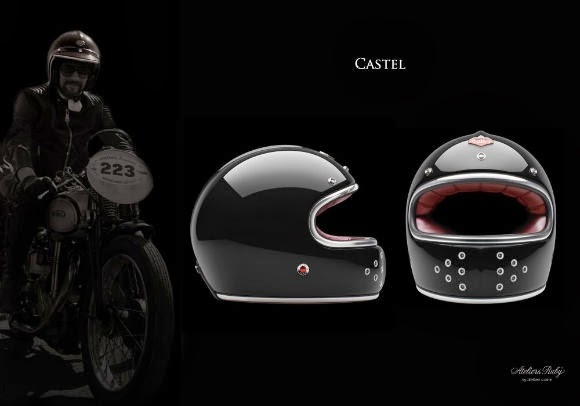 Luxury Parisian house serving mobility, Ateliers Ruby create, under the direction of Jérome Coste, prestige helmets, plus key equipment of an independent and free lifestyle for Motorcyclists and Gentlemen Drivers looking for a great escape. Ruby products are imagined to be faithful travel companions for the long run, manufactured in the state of the art with traditional luxury savoir-faire, allied with high technology. Ruby was born from obsession. Parisian designer Jérome Coste was raised in a world of mechanical sports, and developed a fascination with the performances and uniforms of champions; his daredevil temperament meant emulating his heroes earned him six concussions - with no ill effects - but added a new dimension to his interest in helmets, and he began to collect them … the rest reads like a very interesting lifestory, and is available here. In four years and two cult models - the Pavillon and Belvedere - Ruby helmets have revolutionized the genre and changed our relationship to this tool of protection by creating an object of desire. The Ruby helmet is now the benchmark for this new accessory, key to the 21st century wardrobe, knighted by grand luxury houses as well as professional pilots. Les Ateliers Ruby cultivate their singularity and their customers by offering a multiple of versions of its helmets, two new collections a year, limited editions with guest artists and the "Ruby Costume" personalization service making singular original creations. 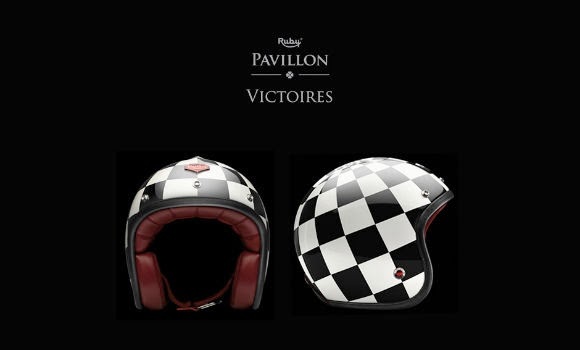 Ruby’s unique expertise is now extended to jackets, racing suits, and leather gloves at the Ruby Boutique, at #1 rue Herold in Paris. 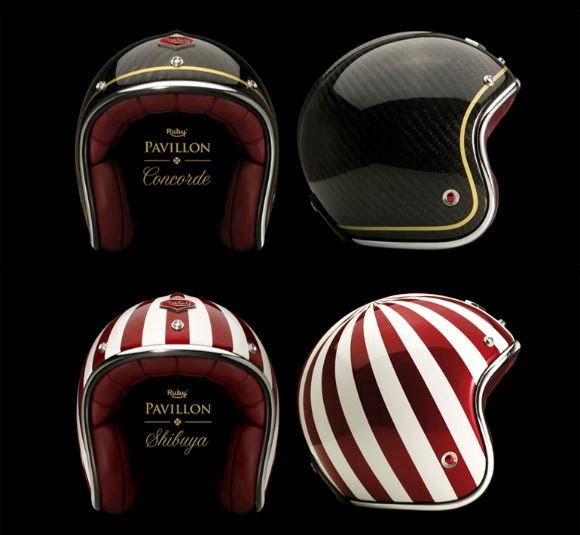 The “Belvedere” design is based on the original Ruby helmet: the “Pavillon”, however the new addition to the Ruby motorcycle helmet range has the added advantage of an articulated visor that covers the riders entire face; it acts as a pivoting windscreen. The original “Pavillon” is a contemporary classic design, and is based on the classic, “retro”, even historic forms. 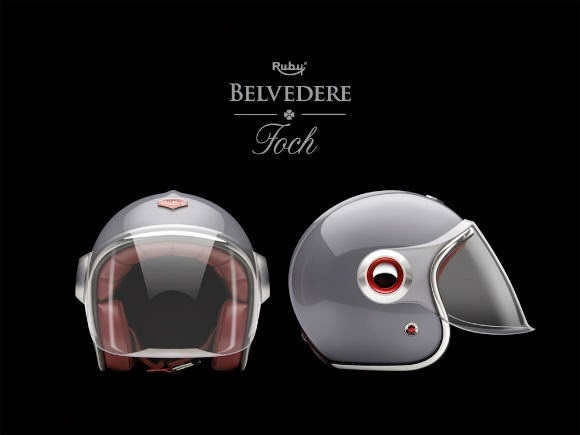 The Belvedere becomes a completely different; the simple addition of the visor and the two aluminium visor pivots takes the Ruby helmet in to a retro-futuristic world, the helmet mimics the ‘Robot’ like characteristics of cartoon characters in Japan. Every single “Belvedere” comes in the traditional red Ruby box with 3 separate visors: one transparent, one smoke and one racing dark. Ruby have made sure the visor is easy to change… Simply unscrew the metal plates that hold the visor in place, replace the visor and screw the aluminium plates back on. The Articulation system allows the rider to open the visor in three positions, plus an extra notch to hold the shield in place at higher speeds.